Do you need a dessert for a potluck dinner or party? This layered chocolate delight lives up to its name, and it's always a hit! Just be prepared for recipe requests; take along copies of the recipe or share it with friends via email or Facebook. The chocolate delight dessert is made with a graham cracker crust. 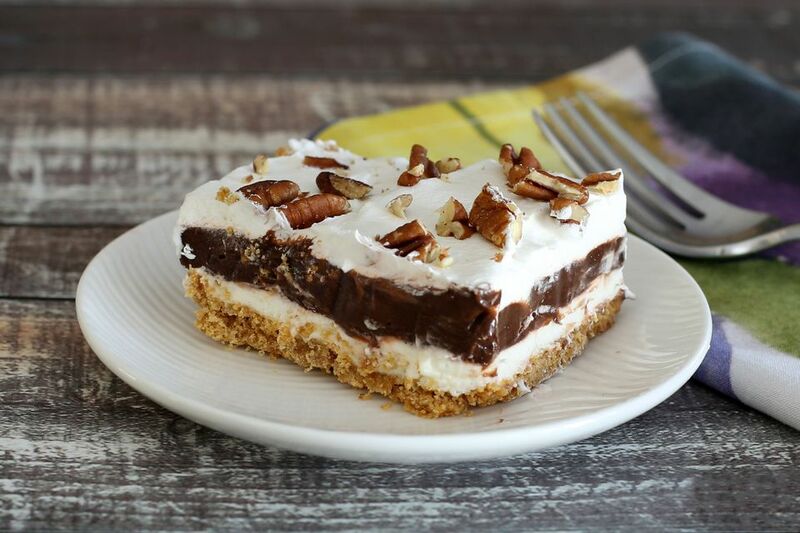 It's layered with pudding, sweetened cream cheese, whipped topping, and optional chopped walnuts or pecans. The variations on this basic recipe are endless. Make it with a pecan shortbread crust or a pretzel crust, or use butterscotch, pistachio, or banana pudding. See the many possibilities below the recipe. Heat the oven to 350 F/180 C/Gas 4. Combine the graham cracker crumbs, 2 tablespoons granulated sugar, and the melted butter; press into the bottom of a 9 x 13 x 2-inch pan. Cool completely before assembling the layers. Beat the softened cream cheese with the confectioners' sugar until smooth. Stir in half of the whipped topping until well blended. Beat the pudding with the milk as directed on the package (using only 3 cups of milk). Spread over the cream cheese layer. Top the dessert with the remaining whipped topping and spread to cover. If desired, sprinkle with chopped pecans or walnuts. Salted Pretzel Crust: Combine 1 1/2 cups of crushed pretzels with 1/3 cup of granulated sugar and 1/2 cup of melted butter. Pat the mixture in the baking pan and bake at 350 F (180 C/Gas 4) for 8 to 10 minutes. Cool completely and proceed with the recipe. Nut Crust: In a bowl combine 1 cup of finely chopped pecans with 1 cup of all-purpose flour and 1/2 cup of melted butter. Pat the mixture in the baking pan. Bake at 350 F (180 C/Gas 4) for about 20 minutes, or until set and lightly browned. Cool completely and proceed with the recipe. Shortbread Cookie Crust: Replace the graham cracker crumbs with 2 cups of finely crushed Sandies or Pecan Sandies. Vanilla Wafer Crust: Replace the graham cracker crumbs with 2 cups of finely crushed vanilla wafers. Butterscotch Delight: Use two boxes of butterscotch pudding instead of chocolate pudding and replace the pecan topping with Heath toffee chips, shaved semisweet or milk chocolate, or chopped candy bars, your choice. Lemon Delight: Use lemon pudding and top with toasted coconut or shredded or grated lemon zest. Banana Delight: Use banana pudding and top with toasted coconut. Pistachio Delight: Use pistachio pudding and top with chopped pistachio nuts. Cookies and Cream Delight: Use 1 package of instant chocolate pudding mix and 1 package of instant cookies and cream pudding. Or use white chocolate pudding and sprinkle 1 cup of crumbled Oreo cookies between the first whipped topping layer and the pudding layer.